Sunlight fuels biological, chemical, and physical processes in the ocean as well as atmospheric processes. Photosynthetically Available Radiation (PAR) is a key factor for ocean biology. PAR is a measure of the sun's visible energy that plants can absorb and utilize for photosynthesis. The depth of PAR penetration determines where phytoplankton can survive. 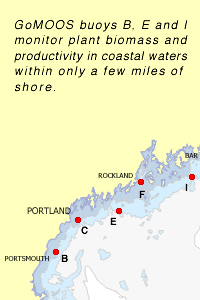 By continually measuring how sunlight behaves in the upper ocean, GoMOOS helps us model the primary production that drives all marine food webs, leading to the rich fishery the Gulf of Maine is known for. We measure PAR along the Gulf of Maine coast. Plots above show how PAR varied over the past four days. On a clear day, PAR should ideally peak at noon and vary with sun angle (due to time of day or time of year); this is shown by blue curves. Measured variations in PAR, shown as green lines, can arise from clouds, and atmospheric haze. PAR decreases with ocean depth because sunlight is absorbed and scattered by water, suspended particles, and dissolved material.